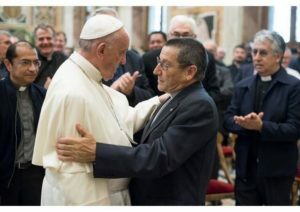 Pope Francis greets Fr. Paco Blanco MSC, an old firend from Argentina. He was speaking to a group ready and open to hear his message. As we arrived that morning for the audience you couldn’t help but be awed by the surroundings of the Vatican buildings. Designed to impress, they did just that. 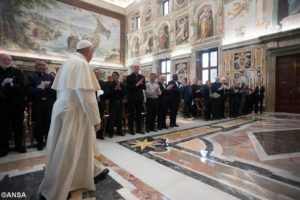 However, in contrast to the stateliness of the architecture, the beauty of the frescos, and the livery of the Swiss Guard, Pope Francis comes across as a simple man. He entered in a low key way, smiling and acknowledging with gratitude the presence of missionaries from all around the world. It was clear he was a little tired, but he has a sense of authenticity and simplicity of presence that is both difficult to describe and utterly unforgettable. He was particularly enthused to meet an old friend of his, Fr. Paco Blanco MSC, the Provincial of our Spanish Province with whom he worked in Argentina. Pope Francis told us that the Church sends us out as Missionaries of the Sacred Heart to show by our lives and by our works the passionate and tender love of God for the little ones, the underprivileged, the vulnerable and those whom our world has discarded. It was about learning from Christ how to give hope and dignity to the destitute and to go forth to all places, where people are in need of acceptance and compassion. This is something we try to do, whether it is around integrity in creation work on Pacific islands that are being overwhelmed by the effects of global warming, parish ministry in Ireland and the UK, advocacy with indigenous groups in Brazil and Australia, youth festivals in South Korea, solidarity with the oppressed in Venezuela, or schools in marginalised communities in Tamil Nadu. As this Chapter enters into our final week we look at what concrete steps we need to take to respond to the signs of our times. We have identified a number of key themes that will form the basis of our future vision and mission, including formation of the human person, our work with the laity, integrity in ministry, justice, peace and integrity of creation, child safeguarding, and communications for the 21st century. Through your prayers you are as essential part of our General Chapter. 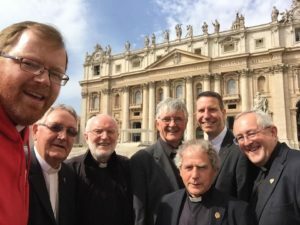 We would ask you to continue to pray that the work of MSCs draws its inspiration from the Heart of Christ and seeks to go out and carry out His will, especially where it is most needed. Our Lady of the Sacred Heart. Pray for us. 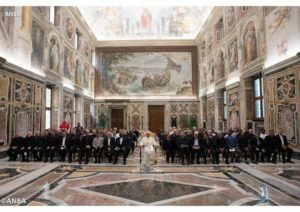 The full text of the Pope’s speech can be found here.